While air filters and regular air duct cleaning are excellent ways to improve the quality of air in your home, we recommend in-duct air purifiers for all homeowners and property owners in Florida. In-duct air purifying systems neutralize pollutants, allergens, dust, odors and even particles that can make your family sick all before the air leaves the ductwork. Air purifiers are the perfect way to complement your endeavors to improve your home’s indoor air quality. Improve the quality of your home’s air with an RGF Air Purifying System. 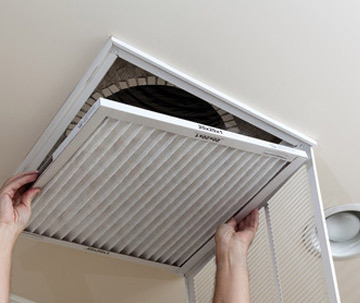 Our air purifier technicians are skilled in the in-duct installation of RGF air purifying systems. We trust RGF for all of our air purifying needs because the company’s in-duct purifiers effectively and efficiently target pollutants, odors and even bacteria and viruses, removing these unwanted particles and oxidizing the air. The air in your home will be cleaner and safer with the use of RGF air purifying systems. The majority of Floridians spend most of their time indoors. However, few understand the importance of indoor air quality. Did you know that 50% of major office buildings have compromised HVAC systems? While it’s harder to accurately reflect the percentage of homes that have contaminated air ducts, you wouldn’t want your children and pets breathing polluted air that carries health risks. Ductwork is the perfect environment for the growth of mold and bacteria, which is then distributed throughout the home. In addition to bacteria, pet dander, pet hair, dust, pollen and plethora of other allergens can easily travel through a home’s ductwork. We recommend using RGF in-duct air purifying systems because they distribute friendly oxidizers into the air, which attack pollutants, viruses, bacteria and odor-causing particles. These oxidizers travel throughout the ductwork and airflow of your home, attacking allergens and mold spores wherever they are encountered, meaning these oxidizers can attack particles outside of the ductwork. RGF air purifying systems not only produce cleaner air in the ductwork, but they purify all the air of your home. AUV Stick Light+ PCO and AUVM Stick Light+ PCO: The AUV Stick Light is installed in the air conditioner coil to provide your home with years of air protection and disinfection. AUV Stick Lights treat the air right from the source so your home can be cooled more efficiently while saving energy. Guardian Air HVAC Cell: RGF’s Guardian Air easily mounts inside ductwork for complete air quality control. The Guardian Air is designed to improve air quality by eliminating air pollutants, odors, chemical odors, mold, viruses, bacteria and smoke, leaving the air in your home safe and pure. The Guardian model can remove pollutants before they travel through the ductwork and escape through small gaps. The Guardian uses an oxidation process which creates an oxygen-rich environment. Why Choose LIBERTYAIR Air Purifying Systems? Our systems kill 99% of airborne and surface viruses, mold and bacteria. Our systems kill 85% of odors and gases. Our systems are enough for homes and are also used in schools, hospitals, restaurants, daycare centers and other commercial buildings. Conveniently and safely remove air pollutants before they escape the ductwork.